Storing our belongings for safekeeping is something we do naturally. You want to protect it from damage or theft. What happens though, when those values are very large, or cannot be brought indoors? It’s far too costly or impossible in many cases to construct a building from scratch that will permanently reside on the residence for storage. That’s when portable shelters come in to save the day. Here are 4 things you should know about portable shelters and why they make the ultimate choice. First, you’ve likely spent a lot of money to acquire the valuables in your life. Whether it’s a classic car you like to show off on the weekends, an RV or even pricing farming equipment, the last thing you want to do is put it at risk out in the open where the elements can cause it to tarnish, break and even become useless. Portable shelters offer amazing protection from the elements and quality frames and covers can withstand even the strongest of wind and weather situations. Since you’re not having to break ground, pull permits and start a whole new construction, you’re also going to be saving a ton of money by going the portable shelter route. It’s important to not find the cheapest one out there but to choose a quality, named brand shelter to protect your investment and have a solution that withstands time and delivers the protection it’s advertised to. We talk a lot about using portable shelters in the yard as extra garage space, but they also make for great on-the-go storage and shelter. Take a smaller size portable shelter with you camping, to large sporting events or other times when outdoor weather is going to be a giant factor in your day. They provide instant, easy access to cover and can shield you from rain, sun, and other conditions. Speaking of using your portable shelter for more than just storage, many people are using these dwellings for other reasons too. Start a greenhouse in winter, host your next outdoor party under one and set-up a picnic where guests aren’t afraid to come out because a shelter is provided. The opportunities are endless. If you need reliable, cost-effective storage space for your car, truck, boat, or supplies, then portable garages can be a life-saver. Why choose a portable garage over a stationary garage? The beauty of portable garages is that you don’t necessarily have to choose between one or the other. In fact, many people benefit from having both. Why? Sometimes stationary garages and sheds are just not spacious enough. Whether you are trying to decide between the two, or are considering a portable garage for any overflow that your stationary garage cannot house on its own, then you’ve come to the right place. Let’s break down the 4 benefits offered exclusively by portable garages. They wouldn’t put the word “portable” in the name if it wasn’t true. When you plot out and build a stationary garage, it will stay in the same spot. If you decide to move a stationary garage, you would have to invest in some labor-intensive services. Even if you’re a hardened DIY advocate, moving your garage will take a lot of your own time and energy. Conversely, portable garages are extremely easy to move and install. Don’t like where your extra furniture, car, or lawnmower is stored? No problem: just break it down and move it. What if you wanted to host a party? Making room for your guests to park while also protecting your valuables can be difficult in a pinch. With a portable garage, all you have to do is decide where it would fit best. Once you’ve settled on the right spot, then you can move it quite easily. In addition, with this level of portability, you can offer to bring shelter with you to a friend’s house. Forget bringing a bottle of wine. Instead, bring something that everyone will appreciate, whether they realize or not. Since portable garages don’t need to stand on a foundation, no permits are required. This simple fact saves a lot of time and effort. With portable garages, you don’t have to worry about completing paperwork or following up with town hall; all you need is an even surface to deploy your anchor. Check with your town for any other requirements on placement and property distances. When most people see how easy it is to install and move portable garages, they often wonder if it really provides reliable protection for vehicles and valuable possessions. The answer? Yes, it does. Typically comprised of a steel frame and durable fabric, portable garages are well-equipped to withstand harsh weather conditions. Now that you understand the benefits of owning a portable garage, what are you waiting for? 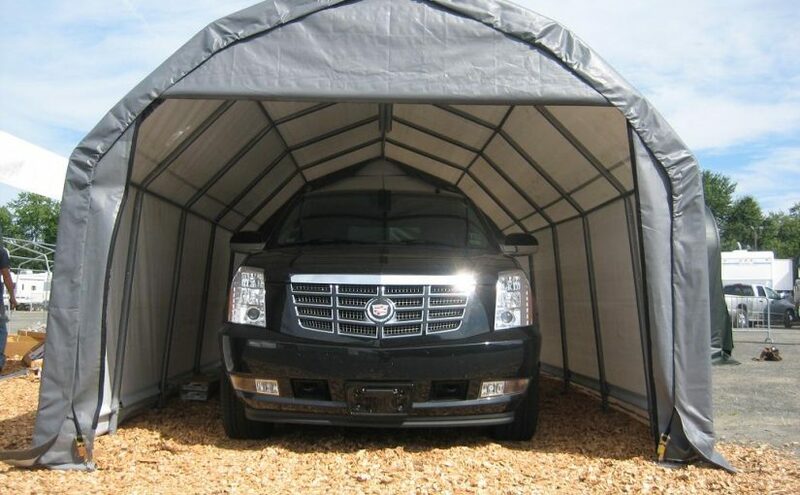 Shelters of America offers a variety of different portable garages and shelters to fit your unique needs. Experience supreme protection first-hand: shop today! In case you haven’t realized, we’re only 3 short months away from the holiday season (two if Thanksgiving is the commencement of holiday season in your home.) If you’re hosting guests and events over the course of these weeks, you may be getting into a panic thinking about how you’ll ever clear room out of the guest beds or where you’ll put all the clutter you’ve accumulated over the summer so it’s not an eyesore during festivities. Add storage to your property that’s out of sight from guests and that gives you the extra space you need during these months to store the gifts, decorations and that unforgiving mother-in-law who will be surveying your cleaning abilities. The dwellings can be set-up and easily taken down when not in use and best of all, they can be set back in your yard away from your nicely decorated exterior. After the guests are long gone and warm weather rolls around you can even decide to leave the portable garage up and use it to store lawn equipment or as a shaded area for any outdoor parties or picnics, you host. 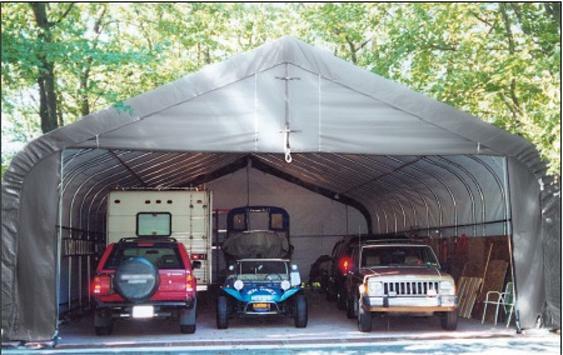 Portable Garage Depot offers instant, temporary carports, portable garages, building kits and more. All frames are made of powder coated or galvanized steel tubing and have covers made of durable layered Polyethylene in a variety of color options. This material helps stop ripping and tears and can withstand the elements. We also provide the anchors you’ll need to keep the portable garage in place wherever you decide to install it. Enjoy the holiday season for once. Leave the mess out of sight and enjoy the party with your guests. The spring and summer months are the most common times of year to go camping. This fun activity offers a great opportunity to disconnect from our mobile devices and hectic lifestyle and reconnect with nature and family and friends. 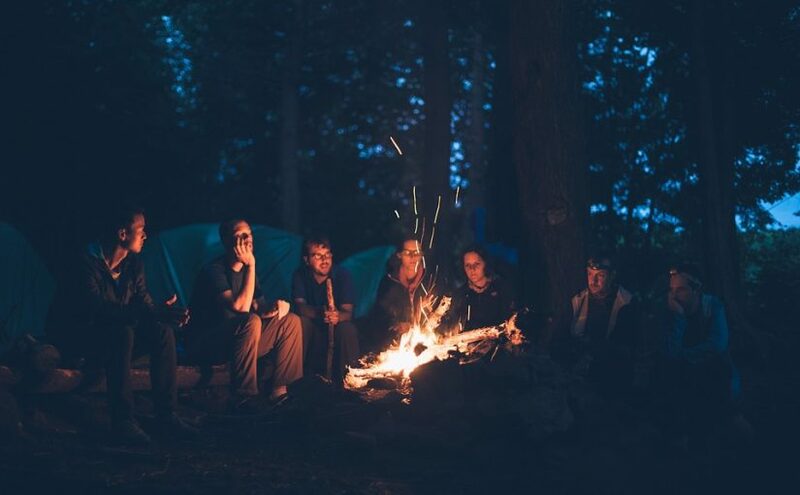 Whether you prefer to rough it out in the wilderness with bare necessities or park your RV at a more accommodating campground, there are ways having a portable shelter along for the ride (other than your tent) can be beneficial. Here are some of the ways a portable shelter can make your camping experience more enjoyable. That’s the advice you’ll typically get when you tell someone you’re going camping. After all, you’re there to enjoy nature and what it has to offer, not lug around half of your possessions. The great thing about portable shelters is that they are easy to transport. Depending on the type and size you can take them down and put them up without much effort and they can pack up nicely. Carports and other smaller covered canopies are great for a covered picnic area and can remain pitched until your camping trip is over. Nothing’s worse than a day of fun outside spoiled by adverse weather conditions. Heavy rainfalls, beaming hot sun and windy conditions can all make being outside borderline unbearable. With a portable shelter, you’ll have adequate protection from the elements. Not only are they designed to retain heat if needed but with suitable ventilation standing under them makes sense when the weather isn’t cooperating. Give yourself a chance to dry off, eat with fewer flies around and get out of the harmful sun’s rays for a bit. Shelters of America has everything you need to store and shelter your belongings. Our instant storage buildings are made with galvanized steel frames to ensure true All-Weather protection from sun, wind, rain, ice, and snow. 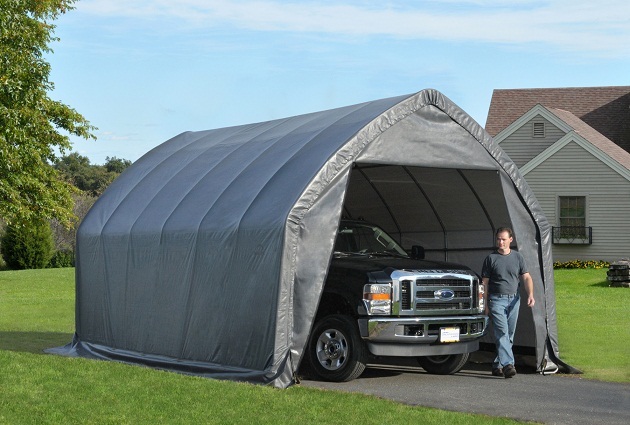 Our inventory includes truck covers to instant shelters, boat covers, car garages, garage kits, portable shelters, portable garages, carports, car covers, portable buildings, motorcycle covers, metal carports and metal buildings. 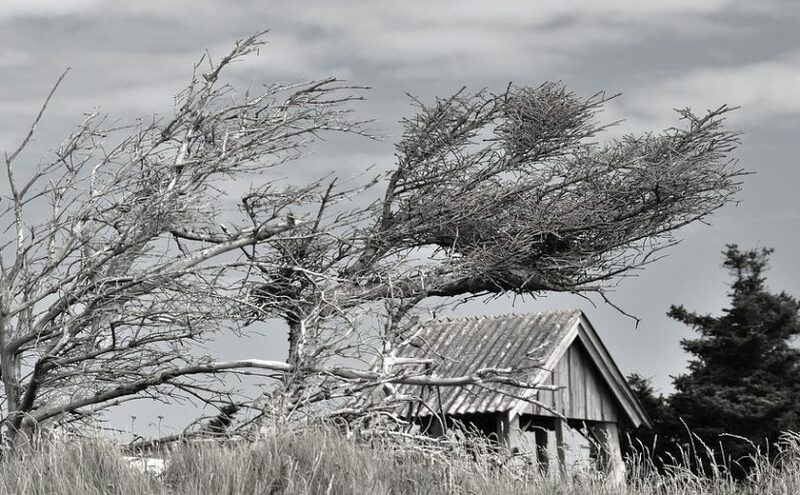 If you’ve been thinking about adding a portable shelter on your property, then you may already have some usage reasons in mind. Whether it’s to store a classic car over the winter, keep lawn equipment neat and protected or to start a greenhouse, there are endless possibilities when it comes to using portable shelters. 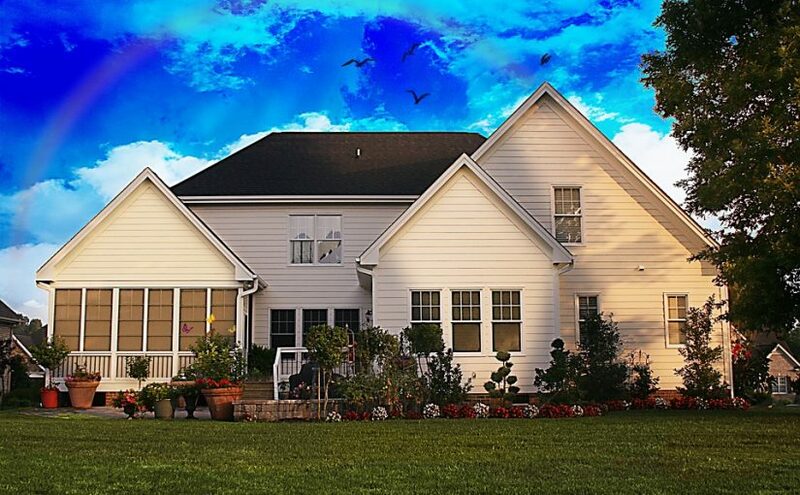 After you decide the use, you’ll need to find a building type best suited for those needs. Metal carports, enclosed shelters or peak style buildings are just some of the options to choose from. For this post, we’ll be looking exclusively at peak-style storage buildings and the reasons to select this style. One of the top reasons people choose peak-style storage is to accommodate a very tall item being stored. An RV that’s put away during the colder months will work great under a peak-style storage building because it can be driven right in and out due to the higher ceiling and sizing. Another common reason to choose a peak-style building is the shape of the roof and its ability to keep the elements away. Not only does the cover keep rain and snow from getting inside and damaging the contents of the portable shed, but it’s pointy top also flushes water off and away from the top of the dwelling so if you live in an area that gets large snow accumulations you don’t have to be so concerned about the weight causing the building to collapse onto your valuables. 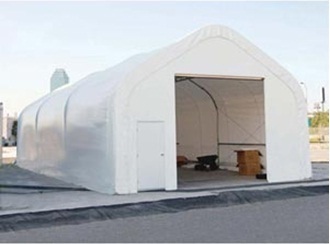 At Shelters of America, our peak-style storage shelters are made for superior durability. From frames made of 14 gauge 2.315 OD Allied Gatorshield structural steel tubing to 12.5-ounce, 24-millimeter thick rip-stop polyethylene material that has been treated to provide protection from the sun’s UV rays and a skylight and steel roll-up door with lock. For most parts of the country, cold weather and snow are now far behind us. That means, time to put away the winter toys and store them until next season. 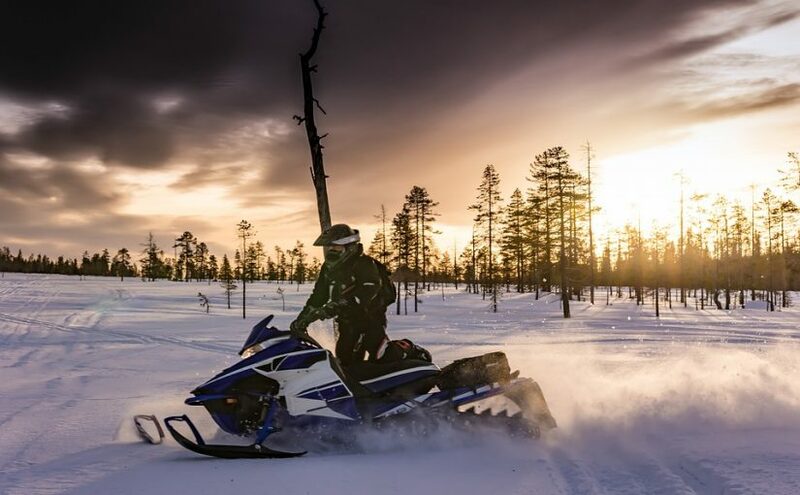 If you’re an adventure seeker who likes to spend your leisure time riding a snowmobile, you’ll want to store it properly so you can get back out and ride come next season. Perhaps you have a summer toy – a motorcycle, or ATV that you’ve kept stored over the winter. If so, you can swap them out. Or this may be your first season with a toy and you may be considering your options. A portable shelter is the perfect choice. It’s not only more affordable than renting storage space or having to build an additional garage on your property, but it can also be temporary and taken down and stored away when not in use. Here are the necessary steps to take to store your snowmobile over the summer. Before you put your winter toy away for the season, you should take care to clean and remove any dirt and debris that’s built up over the winter months. Even if it appears clean, it’s important to give it one last wash down with warm soap and water to ensure that all eroding salt is off. You don’t just want to clean the snowmobile itself, but also the area its’ going to be stored. Make sure there is no damage to the cover on the portable shelter like rips and tears and that all particles and dust are cleaned out before you put your vehicle in for storage. Depending what part of the country you live in, your vehicle may be tucked away for quite a few months. Over that time period there are chances that critters can get in and that ground conditions can change – both leading to damage. Use moth balls in areas where critters may go – like under the hood. Also hoist the vehicle up off the floor. It’s advised that the springs be removed and a jack stand be put under the rear bumper with a wooden box on the front to keep tension off the suspension while it’s stored and to keep it from being damaged by changing conditions at ground level. 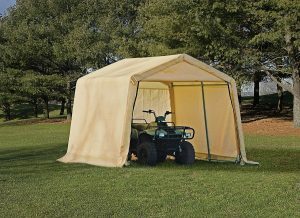 Shop Shelters of America for all your portable storage needs. 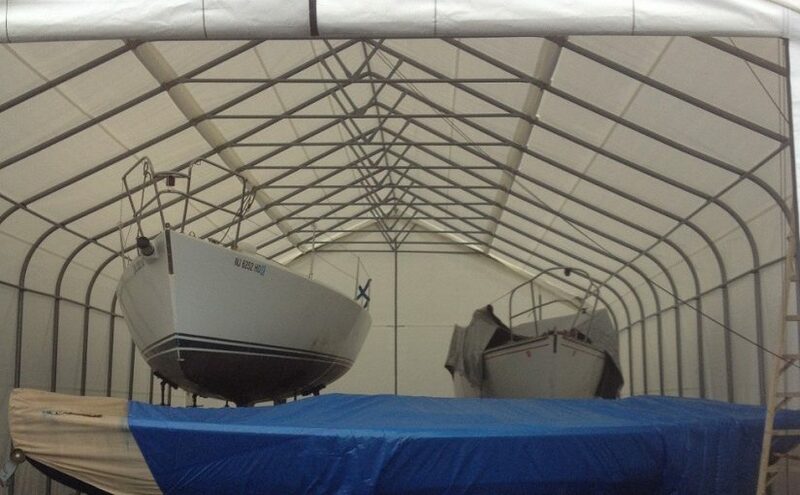 From truck and boat covers to garage kits, portable shelters, motorcycle covers and more!